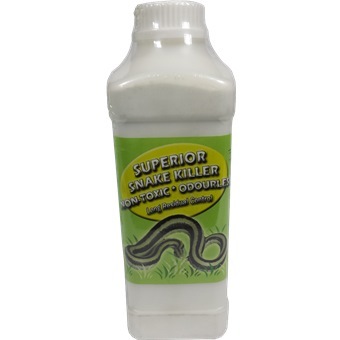 This Snake Powder effectively kills and repels snakes. Commercial Grade with fast de-mobilizing active. A new formulation that snakes has absolutely no immunity. This Snake powder is composed of finely milled fossilized shell of minuscule organisms called shell powders. The microscopically fine, sharp edges desiccate the snakes moist exterior skin upon contact and the snakes will dehydrate and die within 12 to 36 hours. The snakes also die when they eat the dust. Sprinkle a light layer of snake powder in area where snake frequent, including sinks, sewer pipes and drains, and in cracks and crevices.